Like most of Mexican cuisine that crosses north of the border, chili powder has become a watered down version of the real thing. 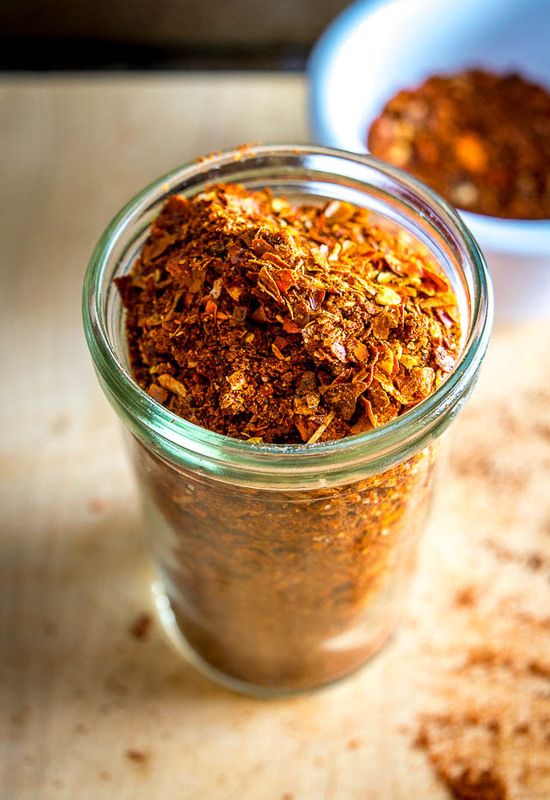 Instead of ground dried chilis, you’re getting ground chilis along with healthy doses of salt, cumin and probably a few other additions that you don’t need in there. 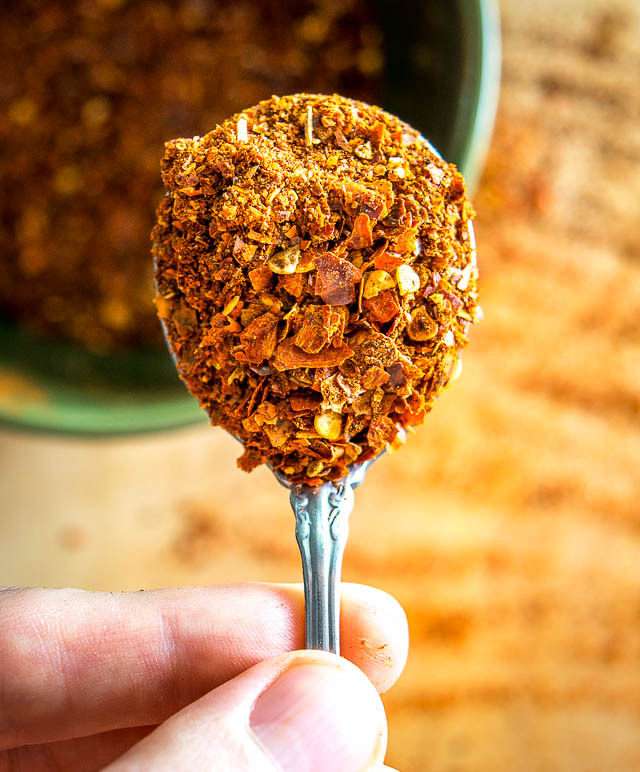 So if you use these supermarket chili powders in a recipe like our Homemade Taco Seasoning (see pic below) then you are essentially doubling up on the salt and additional spices, and getting farther away from the authentic flavor of the ground chiles. One of the benefits of getting snobby about your chili powder is the control it will give you. Not only can you easily gauge the sodium level in your dishes, but for all of you out there on a cumin-free diet you’ll be thrilled to have a version of chili powder that you actually like. 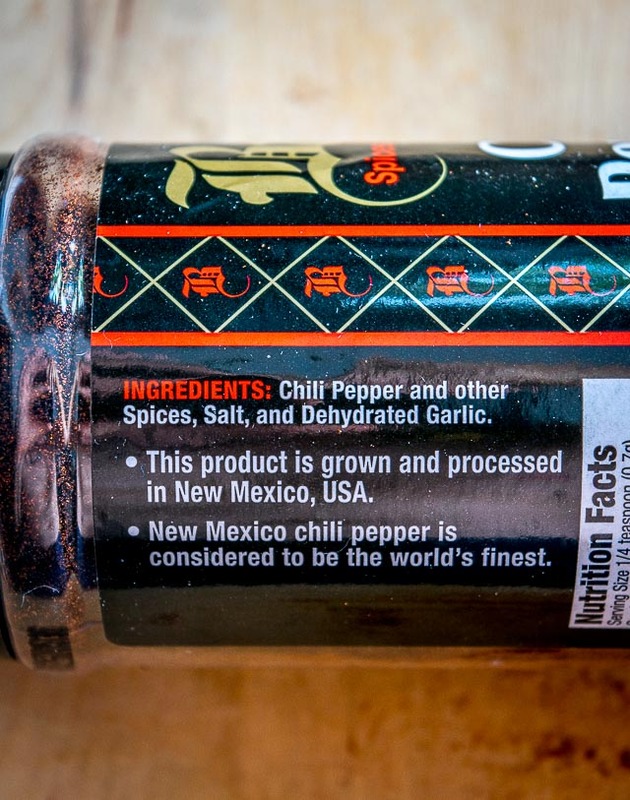 So how authentic do we need to get for a massive chili powder improvement? 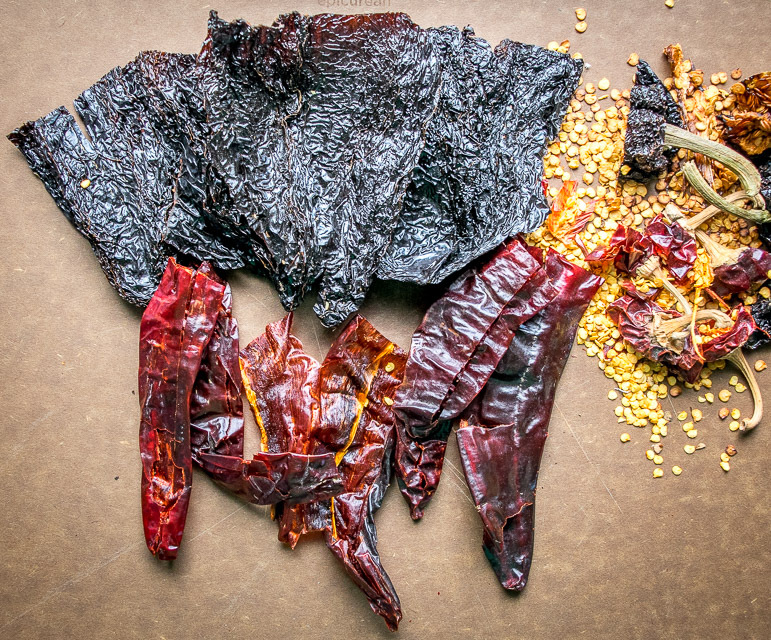 Yes, you can buy dried whole chilis and grind them yourself. For example, roasting and grinding some Ancho and New Mexican chilis should produce a great result. I’ll do a post on this process soon, but I want to offer an even simpler alternative that might be more sustainable for those of us who barely have time to cook dinner, let alone grind your own chilis. First, try to get your hands on some chili powder that doesn’t have any additional ingredients. This can be harder than it sounds. One of the easiest ways to do this is to head straight to the source. The Southwest produces gobs of chili peppers on a yearly basis and there are plenty of merchants in the area that will gladly ship their products nationwide. I’ve been ordering from El Potrero Trading Post recently and they have a good selection of regional chili powders. There are a number of varieties that fall under the “New Mexican Chile” umbrella and most of them have a mild, unassuming nature that makes them a great base for your chili powder concoctions. For example, my most recent order from El Potrero looked like this. Those are 1 lb. bags of real deal ground New Mexican chiles. The top bag is a sun-dried, crushed Big Jim variety, the middle bag is a crushed, Sandia green chile, and the bottom bag is a sun-dried red Sandia powder. And yes, it was the finest smelling package I’ve ever received. I don’t have any affiliation with El Potrero but I like ordering from them because the product feels close to the source. I’m sure there are also other merchants in the area who ship equally good products. (Let me know if you’ve tried any and I will put in an order and report back!). 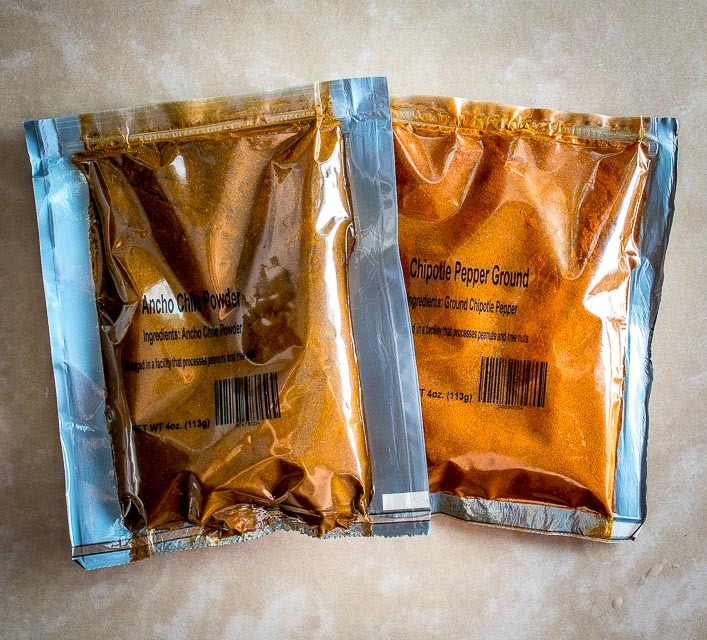 You’ve also got the option of buying chili powder from the more general online spice houses. For example, I recently tried out a few varieties from My Spice Sage. That’s ground Ancho chile on the left and ground Chipotles on the right, with no additional ingredients in either bag. Overall I was pleased with not only the product, but also the cost because they offer free shipping on orders over $10. You might be thinking that Amazon would be a good option but you have to do quite a bit of filtering on Amazon to get away from the spice blends. Most of the recognizable chili powder brands on Amazon will have additional spices and ingredients. And when looking around for Ancho powder I didn’t see anything on Amazon that could compete with the price of My Spice Sage ($6.50 for 4 oz.). Once you’ve got some authentic source material you can mix and match to create flavors that will blow away your friends and family. Here’s what our powdered versions look like next to each other. Combining these three powders will produce a magnificently authentic flavor, but it will be concentrated and have a lethal heat level. That’s where the crushed chile becomes a great option. It’s a less concentrated option that becomes the perfect vehicle for additional ancho and chipotle flavor. This is a good ratio to experiment with and it will produce chili powder that has a significantly more robust flavor than anything you can buy at the store. It’s already delicious even without any additional spices. 100 percent ground chili peppers! If you season chicken breasts and other meat cuts with a mixture like this you will be one happy camper. This is a great seasoning to have on hand and you can use it just about anywhere you’ve been using your regular chili powder. (Note: you can always dial back on the heat by adding more New Mexican chile, or increase the heat by adding more chipotle powder). But more importantly, you finally know exactly what’s in your chili powder! This will make it so much easier to control the flavors in your home-cooked meals. So take a look at that ingredient label on your chili powder! If you see a laundry list of ingredients then it’s time to upgrade to the real thing. Feel free to ask any questions in the comments section below, or you can always send me an email. This a great chili powder combo to experiment with. 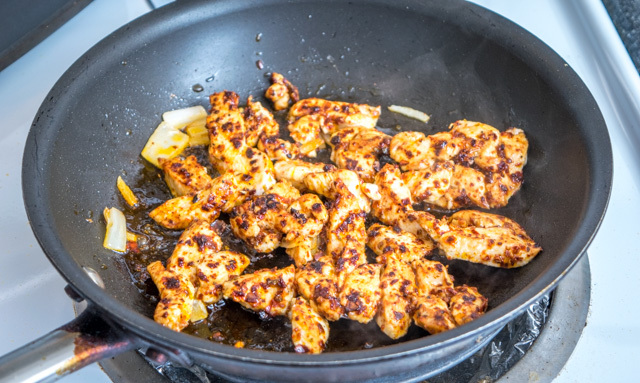 Tons of flavor and it can be used anywhere you use your regular chili powder. Add ingredients to a mixing bowl and combine well. Use immediately and store leftovers in an airtight container along with your other spices. Take a taste after combining. If it's too spicy for your taste buds you can dilute it by adding more of the New Mexican chile. 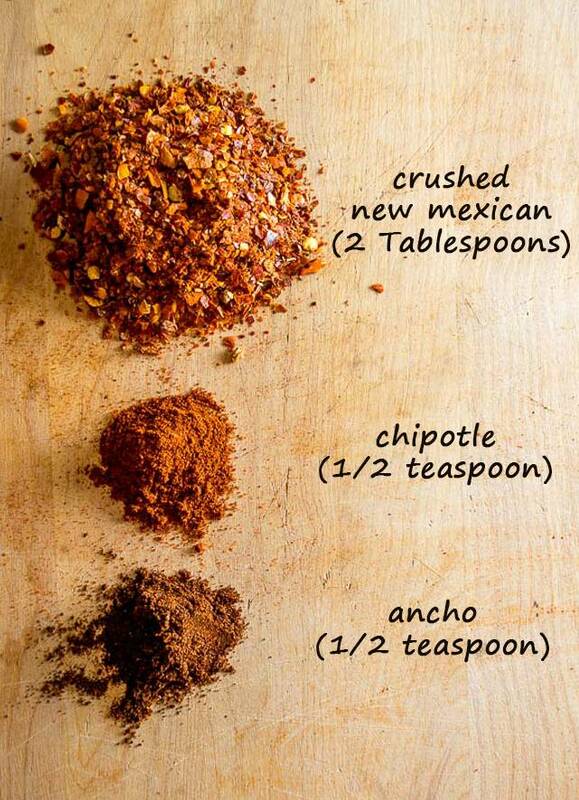 If it's too mild you can add more chipotle powder. What you got again cumin? Hola Marcel! 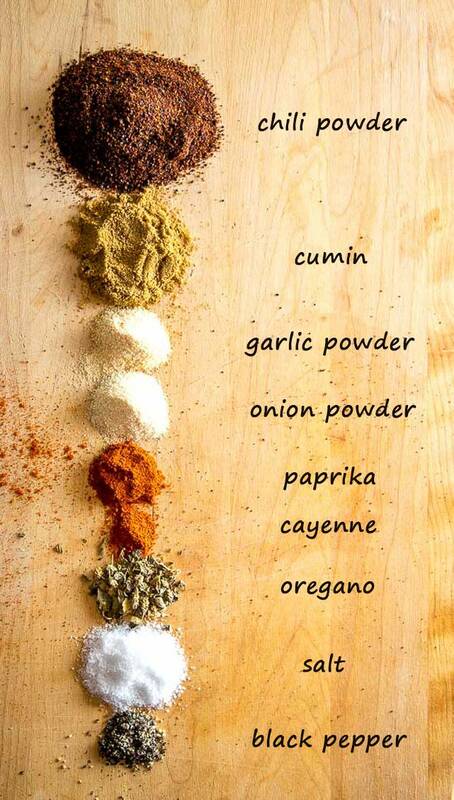 Ha, me and cumin still get along but I do probably use less of it in chili powders than most. Hi, if I want to use New Mexican Chile powder instead of the crushed style to make chili powder, how much of each of the three powders would I use? Also what ratio would this homemade chili powder be to store brand chili powder? If using powder-style New Mexican instead of the crushed style I would probably cut the amount in half and taste test from there. 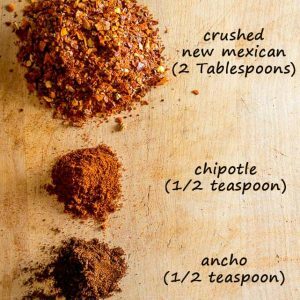 In other words, for each 1/2 teaspoon of chipotle and ancho powder, start with 1 Tablespoon of New Mexican chile powder. If you’re making a larger batch as listed in the recipe box then I would start with 1/4 cup of the New Mexican chile powder. And yes, this is going to be a much more potent version of chili powder than the store-bought equivalent. 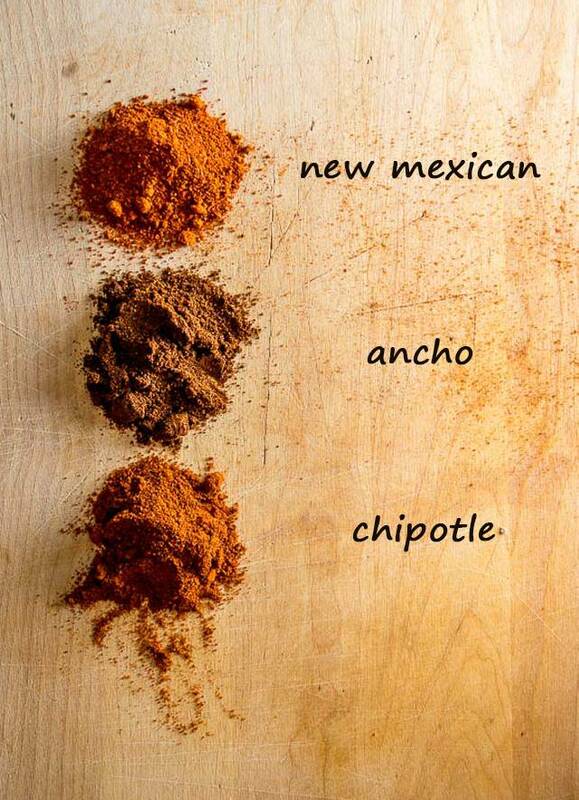 Any time chili powder is called for you can probably cut the amount in half if you’re using the New Mexican-Chipotle-Ancho version, so a 50 percent ratio. If you like milder spice I would recommend adding it incrementally the first time you use it as it can pack some punch and it’s hard to go back in time once it turns nuclear on you. I hope that helps! Let me know if you have any other questions. Good luck! Patrick, thanks for this additional information — I too wondered about using powder-style New Mexican instead of crushed. And thanks for doing this “Mexican Please” blog! I love it — your enthusiasm for the cuisine and your desire to share it! Yeah I’ve become a huge fan of that crushed chili powder — great flavor and I like how it’s less concentrated than the fine grade powders. I would try Spices Inc, there products are freshly ground and they have some great prices. They are the only Co. I use now. Hey thanks for mentioning this Timothy. Cheers. Per your suggestion, I bought the sundried crushed Chili from El Potrero Trading Post. I also bought ancho and chipotle from another place. I made tacos with these using your recipe. Oh Wow!! So much better than the store bought chili powder. So much better flavor. Thank you for opening up my eyes on store bought chili powder. I can’t wait to make chili this fall!! Awesome! Thanks much for the chili powder update. I’ve become a huge fan of that crushed, sundried chili powder — such a massive upgrade compared to storebought and I am a convert for life. Just found your website and enjoy the recipes and writing. I know I am late to the dance here, but I have a serious question. Why are you ordering your spices from the web? Living in Mexico (understanding Cozumel is an island) the variety of chilies available are amazing! Hey Sharon! You’re right, Cozumel has everything you would ever need for home-cooked Mexican food and it’s awesome being surrounded by all those ingredients. But I’m back in the States now and sometimes I have to order stuff online to get the same quality. Cheers. Being a Scottish and Italian food writer, I can totally relate to this. My hair stands on end when I see things labeled as something I grew up with, but it barely resembles it anymore. I’ve just ground up some California and Guajillo peppers and am going to get two others to mix with them. Need a hot one! THanks for this post! Thanks Christina! Keep an eye out for Chile de Arbols and Chile Pequins — those are two fiery chiles that would be a good way to quickly add some heat to your mixture. Cheers.